LED Strip from Aeotec is an all-in-one lighting package that lets you decorate a room with light and it lets you fill a room with light too. In this one kit, you get everything you need for Z-Wave connected lighting: a 197'' full-color LED strip that brightens up to 5,000 lumens, a Z-Wave Plus hub, and a 24VDC power-supply. Installation is a breeze: simply stick the strip on most any surface, plug it in, and sync it with your Z-Wave controller; if it’s too long, easily cut it at any of the marked 8” intervals. In no time, you have 16 million colors of light and dedicated warm and cool light in demand and ready for automation and scheduling via Z-Wave. LED Strip’s 5,000 lumens can be dimmed as low as 1% so that the strip’s dedicate white and dedicated color diodes can always emit the perfect color and shade of light at the right time. Powered by Z-Wave Plus, LED Strip can be responsively controlled via associated Z-Wave devices such as motion sensors, and further scheduled and automated via a Z-Wave gateway. LED Strip is compatible with certified Z-Wave gateways including Homeseer, Indigo 7, Samsung SmartThings, and Mios Vera. 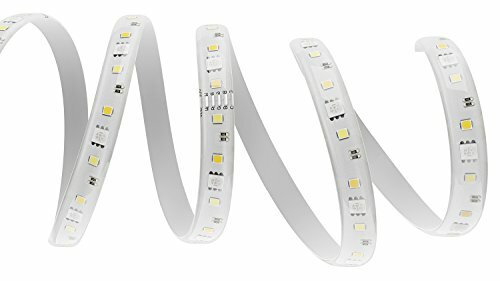 A strip of versatile light and high-quality LEDs, LED Strip offers dedicated diodes for 16 million colors and separate diodes for dedicated true-white lighting. Offers 5,000 lumens (72 watt incandescent equivalent) across 197 inch length that can be dimmed from 0% to 100%. Compatible with certified Z-Wave gateways including Samsung SmartThings, Indigo 7, Open Z-Wave, HomeSeer, and Mios Vera. Z-Wave Plus certified. Certification number: ZC10-16095247. If you have any questions about this product by Aeon Labs, contact us by completing and submitting the form below. If you are looking for a specif part number, please include it with your message.